To be useful, Earth system models (ESMs) must capture important ecosystem feedbacks to environmental change. However, it remains a challenge for models to represent the wide variation in plant sensitivity to, and influence on, the climate. Most ESMs use plant functional types (PFTs), which are lists of parameter values that govern plant processes represented in the models, differentiating plant physiology and growth form among groups such as needleleaf evergreen trees, broadleaf deciduous trees, shrubs, and grasses. Through PFTs, these ESMs already represent some diversity in plant traits—such as variation in leaf shapes and maximum photosynthesis rates—that affect ecosystem processes. In November 2015, 36 scientists representing expertise in Earth system and ecosystem modeling, plant trait observations, and trait data synthesis and analysis met in Rockville, Md., to assess and expand the use of plant functional trait observations in ESMs. Current ESM approaches allow traits to change only through shifts in the geographic distribution of PFTs. Yet observations reveal that key traits vary more within than between PFTs and that correlations among traits reflect coordinated plant strategies. Further, key processes and associated traits are not well represented in ESMs. The discussions revealed priorities for future work to improve the use of plant traits in ESMs. Participants called for better understanding of the traits that remain constant and those that respond to a changing environment. Additionally, they identified a need to understand and represent trait correlations driven by physical constraints as well as those reflecting strategic plant trade-offs. Participants agreed that pursuit of multiple distinct modeling approaches will yield more rapid advances than a single approach at this early stage (Figure 1). Participants also identified numerous gaps in the available data that will limit the accuracy of new models. Data are sparse for belowground traits relevant to plant water and nutrient acquisition and for undersampled but climatically important regions, including biome transition zones and tropical forests, where trait diversity is highest. Participants seek to apply the tools of “big data” to assemble and interpret trait observations for the modeling community. Simpler analytical methods and statistical analyses of ensembles of model simulations may be required to understand the emergent behavior of real ecosystems. Participants seek to apply the tools of “big data” to assemble and interpret trait observations for the modeling community. Next steps include incorporating trait observations that are important to well-understood processes, such as plant water stress, into ESMs and systematic measurement campaigns to fill gaps in observations of belowground plant traits. 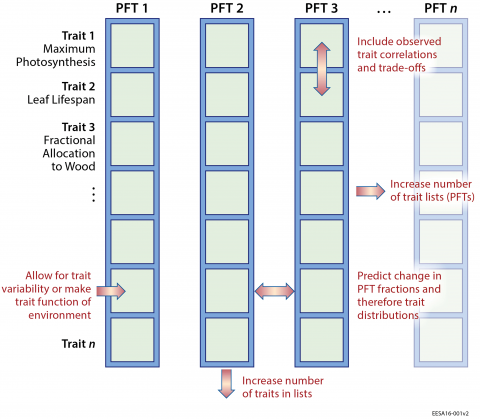 Novel longer-term objectives include representing changes in trait values that emerge from competition among a more diverse collection of PFTs in response to environmental change. The workshop was sponsored by the Department of Energy Office of Science (Biological and Environmental Research) and coorganized by the authors; Peter Reich, University of Minnesota; and Peter Thornton, Oak Ridge National Laboratory. —Lara M. Kueppers, Lawrence Berkeley National Laboratory, Berkeley, Calif.; email: [email protected]; Colleen M. Iversen, Oak Ridge National Laboratory, Oak Ridge, Tenn.; and Charles D. Koven, Lawrence Berkeley National Laboratory, Berkeley, Calif.
Citation: Kueppers, L. M., C. M. Iversen, and C. D. Koven (2016), Expanding use of plant trait observation in Earth system models, Eos, 97, doi:10.1029/2016EO049947. Published on 12 April 2016.